In my last post I said I would be sharing the little gift that accompanied the Cinderella's Carriage card so here it is - an Explosion Box! These are the cutest little surprise boxes anyone young or old could receive. The concept is so simple and the possibilities are endless to what you can put inside! How special is that?? The box pops completely open to reveal tiny gifts for the recipient! 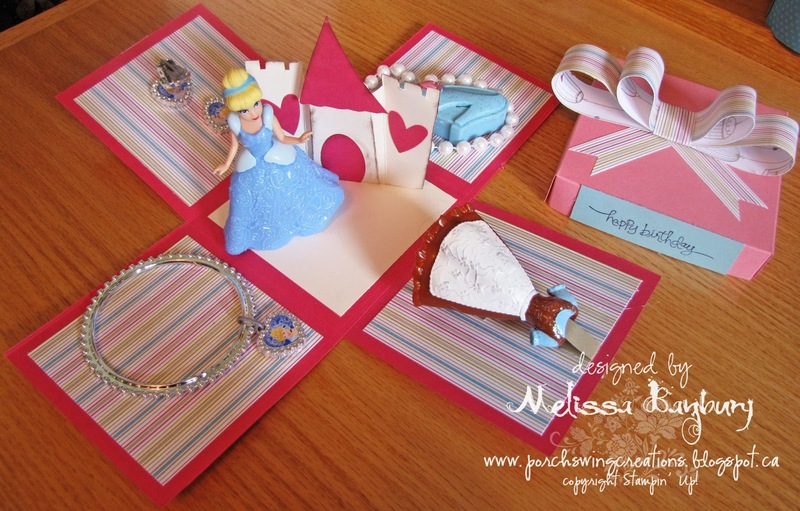 Because this was a Princess themed party and I had already made a card featuring the Pumpkin Carriage from Cinderella, I continued with the same theme when I designed the box. I found a cute little girls jewelry set along with Cinderella figurine that was the perfect size to fit inside the box. Cinderella's pop up castle was the finishing touch! Begin with a piece of cardstock measuring 6" x 6"; score all sides at 7/8". On opposite sides of the cardstock, cut up the vertical score line until you meet the horizontal score line. Apply sticky strip to each tab on the right side of the cardstock and adhere all corners together. Decorate as desired. If you choose to stamp on the lid, do so before adhering the sides together. Begin with a piece of 12" x 12" cardstock. Score at 4" and 8". Turn the paper a quarter turn and repeat the scores. With snips, cut away the 4 corners of the cardstock. 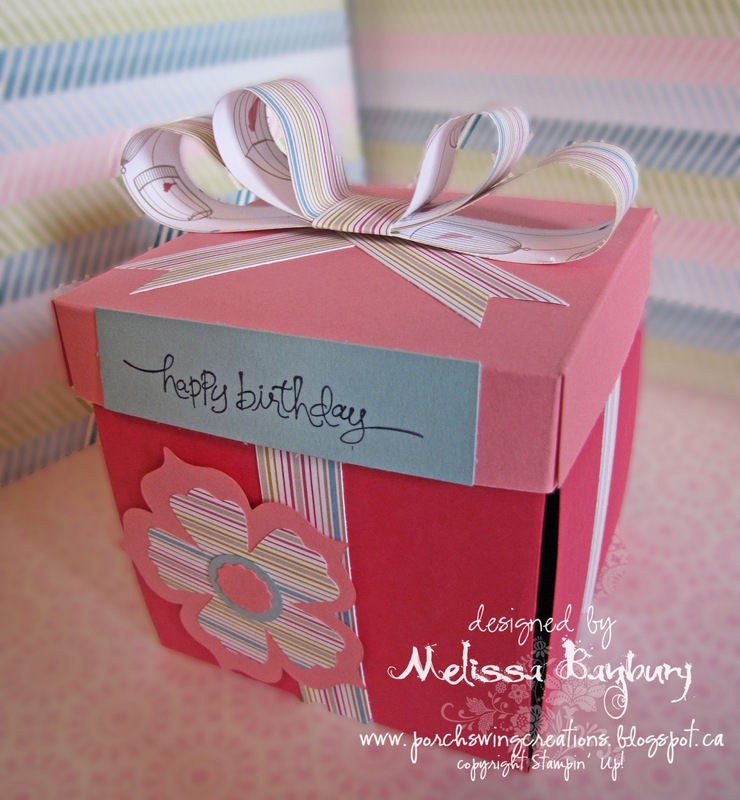 Decorate both sides of the box as desired. I used glue dots to secure each item inside my box. The pop up castle was stabilized by folding a tab on the bottom of the castle first. On the decorative cardstock I cut a slit long enough for the castle tab to slide through then glued the tab from beneath with Tombow. I don't have a pattern for the castle - I cut a rectangle approximately 4 1/2" long by 3" high then scored at 1", 1 1/4", 3 1/4", 3 1/2". The first fold is a valley fold, then a mountain fold, another mountain fold, and finally a valley fold. I used snips to create the turrets on each side of the castle, then sponged all the edges in Chocolate Chip ink. Hoped you enjoyed this one! What would you put inside your Explosion Box? WOW! I hope she was excited by this! My birthday is coming up soon!